Just this past week I was talking to one of the other pastors here at Britton Christian Church. He was telling me about a person in one of his Bible studies that is having a very difficult time overcoming beliefs that were planted deep in her heart when she was growing up in her home church. This got me to thinking about the importance of God’s Word in forming our beliefs about God. If you want to learn about God, His character, how He relates to people, then you will find no better source than the Bible. Even within the Bible, in the pages between Genesis and Revelation, you will find no better authority on the character of God than Jesus, who was God in the flesh. Jesus not only taught the people of His day what God is like, but He showed them by His life what God thinks and how God acts. That leads us to our parables for today. Let’s read together from Luke 15:1-10 and then we’ll talk about them. In Luke 15 Jesus taught three different parables, I call them the parables of the lost. There is the parable of the lost sheep, the lost coin, and the most recognizable of the three, the lost son, better known as the parable of the prodigal son. We will study the parable of the lost son, the prodigal son, at a later time. Isn’t it interesting that the very people the Pharisees despised, avoided at all costs, those were the very people that Luke tells us “gathered around Jesus.” Look at verse one with me. Can you picture it? A crowd of tax collectors and sinners were pressing in to hear, leaning into Jesus, hanging on His every word. Where were the religious folks? Luke tells us in verse 2. Read it with me. The same word is used in the Septuagint, the Greek translation of the Old Testament, nine different times. The Hebrew slaves, just released from over 400 years of oppression under the heavy hand of the Egyptians, muttered against Moses in Exodus 15:23-24. Read it with me. The Hebrews were grumbling about not having water, but the Pharisees were grumbling and muttering about sinners and tax collectors wanting to hear from Jesus. Fussing, muttering, grumbling, griping, groaning, whining, and bellyaching…now that should be every person’s response to people who want to hear Jesus right? Jesus is so amazing. He didn’t dress down the religious leaders for what He saw taking place. 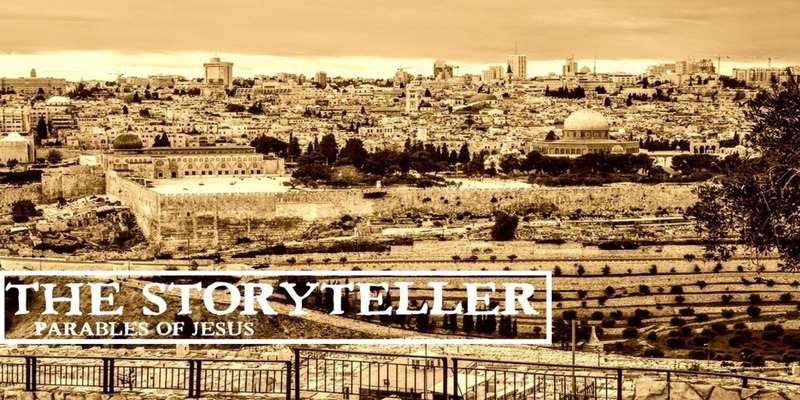 instead, Jesus told them a story, and He put them in the middle of it. Read it again with me. Jesus’ parable was really directed at the Pharisees and teachers of the law. While Jesus told a story about a lost sheep, He taught about the very nature of God. Our God is a seeking God. I’ve thought about this so much this week. The very thought drops me to my knees. Our God is a seeking God. He has always been a seeking God. He didn’t become a God who seeks those who are lost at the arrival of Jesus. He has always been a seeking God. I’ve shared the story with you many times through the years, but I want to tell it again. While I was in college I would go to FCA rallys at high schools and share my testimony with the athletes at the schools. I would tell them about growing up not going to church, thinking Jesus was for nerds and little old ladies, and then I would tell them about when I “found Jesus,” and the changes that Jesus had made since I “found Him.” One day it dawned on me that I hadn’t found Jesus at all, Jesus found me. I was lost, and like the lost sheep and the lost coin, I had no idea I was even lost. The focal point of the two parables we are taking a look at this morning should not be the sheep or the coin. We need not pay too much attention to the sheep or the coin, but we must focus our hearts and minds on the one who left the ninety-nine sheep to go looking for the one lost sheep and on the woman who tore her house apart looking for the lost coin. The reason for focusing on the one who sought them out is because Jesus gives us a picture, a crystal clear picture, of God in these parables. For those who grew up with the idea of an angry God who is just waiting to catch them, get them, and pounce on them; these parables should shatter any such notion. I want to show you a powerful prophecy given to Ezekiel, in Ezekiel 34, that shows God’s seeking nature, His intimate concern for all people, and His willingness to go to the ends of the earth to gather His own. Turn with me to Ezekiel 34. The entire chapter is about shepherds and sheep, God’s leaders and the people He has placed under their care. If you will look at the first six verses with me I want to point out how God’s shepherds were failing His people. God says His shepherds were only concerned with themselves, they were neglecting the flock, and then He lists the specifics. They have not strengthened the weak, healed the sick, or bound up the injured. They have not brought back the strays or searched for the lost. They have ruled the sheep harshly. What should God do? What would God do? Fire the shepherds, hire a headhunter, and replace the bad shepherds with good ones? That would make perfect sense wouldn’t it? Of course! Fire the people who aren’t getting the job done and replace them with shepherds who’ll care for the sheep. That’s not what God did. Look at Ezekiel 34:11-16 with me. God Himself will search for the sheep. He will care for them. He will rescue them from the places where they have been scattered. He will tend them in good pasture. He will search for the lost and bring back the strays. He will bind up the injured and strengthen the weak. He will shepherd the flock with justice. This is a theme that is repeated over and over again throughout the Bible. Can you think of a more powerful image of our God than the image of a Shepherd who will stop at nothing to find His lost sheep? How far is He willing to go to find those of us who are lost? That’s a relevant question isn’t it? Let’s think about this for a moment. If a shepherd has ninety-nine other sheep how long will that shepherd search for the one lost sheep? How far will he travel before he calls off the search and heads home? What risks will he be willing to subject himself to in trying to retrieve the lost sheep? At what point will he say, “It’s just not worth it?” I don’t have the answer to that question because it would depend on the shepherd, but I do have the answer when it comes to the Great Shepherd of our souls, as Peter calls Him in 1 Peter 2:25. “We all, like sheep, have gone astray…” We are all lost my friends. There is no one righteous, no not one. From the preacher in the pulpit to every single person seated in the pews, as well as those who have never darkened the church door, we are all lost until He finds us, takes us into His arms, and claims us as His very own. It’s not that we were in need of His grace and mercy, we will be forever be in need of His grace and mercy. Just how far is He willing to go to find us? I mean, we can find ourselves in some pretty bleak, dark situations can’t we? You better believe we can. I read a story this past week that I had never heard. James Cash Penny wanted to go to college and become a lawyer, but his father’s death forced him to get a job. He took a job working at a clerk in a Golden Rule store. The owners were impressed with his work ethic and he was able to buy a portion of a new store they were planning on opening. By the time the owners retired, in 1907, James had bought all three of their stores. He said, “I cried inwardly, ‘Lord, will you take care of me? I can do nothing for myself!’ …I felt I was passing out of darkness into light.” Will God make His way all the way to a mental hospital to find His lost sheep? You better believe it! I’ve got one even better than that. I share with you a Scripture from Isaiah 53, “We all, like sheep, have gone astray, each of us have turned to our own way…” That’s only part of the story. Let me share more with you. He’s knocking. Will you open the door? Please, please open the door my friend. You’ve got questions? So I do. Open the door. What will others think? I don’t know, but it doesn’t matter. Open the door. You’re afraid you’ll fail, not be able to live up to the commitment of following Jesus? I’ve failed a million times and each time He brings me back. Open the door. Don’t allow anything to keep you from opening the door this very morning.